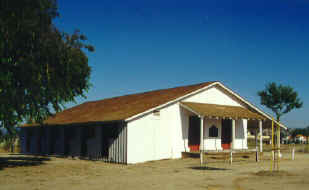 One of the oldest standing buildings in Riverside County is located in Temecula. The building is made of adobe and sits on 4 acres that once was the headquarters for Vail Ranch. This historic building is the Louis Wolf store. Today the building is located next to Kohl’s on Temecula Parkway and is hidden by a wooden wall protecting this historic property. Louis Wolf was from the area of Alsace between Germany and France. Like many others he had heard the stories of gold found in the Mother Lode and as a result Wolf emigrated to California in 1852. He soon discovered that the real ‘gold’ awaited in the opportunity to sell supplies and merchandise to the miners and others. Upon arriving in Temecula Valley, Wolf went to work for John McGee, who had a store on the hill overlooking Temecula Creek. There was an Indian village present, and plentiful water from the Temecula River. This was all located at the junction of the southern Emigrant Trail coming from the east towards Pueblo de Los Angeles and a north-south road going from San Diego to San Bernardino. It is believed that Louis Wolf arrived in the Temecula Valley around 1857. 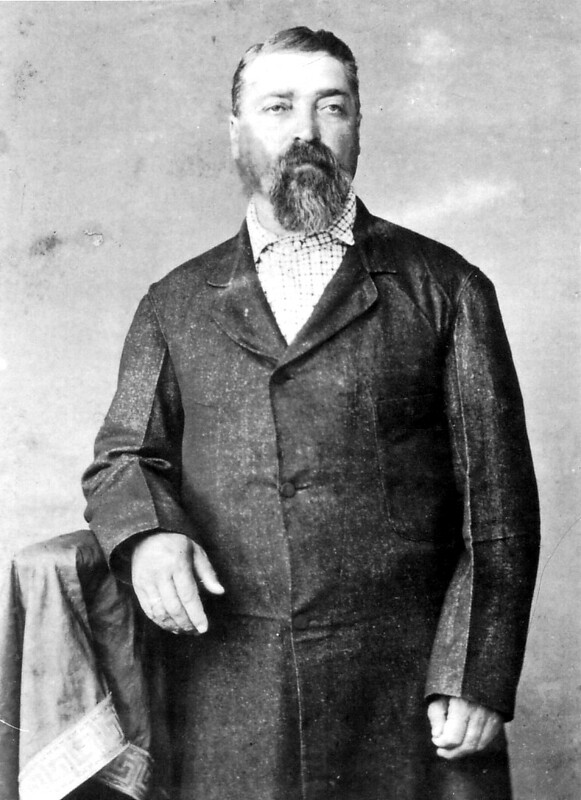 In 1860, Wolf became a United States citizen at the district court in San Diego. On July 9, 1860 he was enumerated in the Federal census for Temecula Township and his occupation was listed as merchant. As in many census records of that time his name was incorrectly spelled as “Wolfe“. In 1862 Wolf married Ramona Place, a woman whose father was from the West Indies and whose mother was a Chumash Indian. When they were married in 1862, Louis was twenty-nine and Ramona Place was sixteen. It is known from records that they had at least eight children. Author Helen Hunt Jackson stayed with the Wolf family in 1882. She may have modeled the main character in her book “Ramona” after Ramona Wolf. The earliest known record of the Wolf Store was in the San Diego tax records for 1868. However his store could have been in place as early 1863, no one knows for sure. The building was made of sun-dried adobe bricks and coated with a thin layer of plaster. This style of construction is the same as the Moreno and Machado adobes on what is now the Santa Rosa Plateau Preserve in Murrieta. Louis Wolf was the local Postmaster and his store served as the local post office in 1870. Besides being the major merchant in the area he also raised cattle and sheep and served as the Justice of the Peace. Part of the Wolf Store is what could be considered the first hotel in the area with 6 small rooms on the south side of the building. The Little Temecula Rancho, an area of some 2283 acres, was originally owned by Pablo Apis, a Temecula (Luiseno) Indian. The U. S. court in San Diego declared Apis’ title to the land unclear and he lost it sometime after California became a state in 1850. Several people including John McGee owned the land before Wolf purchased it in 1870. With the advent of the railroad from San Diego to San Bernardino, Temecula soon moved 3½ miles northwest to what is now Old Town Temecula. Even with the growth of the “new town” of Temecula, Wolf continued his ranching enterprises. However, another blow soon devastated him. His eldest son, Albert, age twenty-one, died of tuberculosis. It was probably this tragedy, more than anything else, that ultimately caused Louis Wolf’s death at the age of fifty-four. Wolf died a wealthy man in 1887. Ramona received 50 percent of his estate and his surviving children received the rest in equal parts. The estate was valued at $100,000 in 1887 dollars. Based merely on the value of gold at $16 per ounce at that time, his estate would now be worth roughly $2.25 million dollars today. 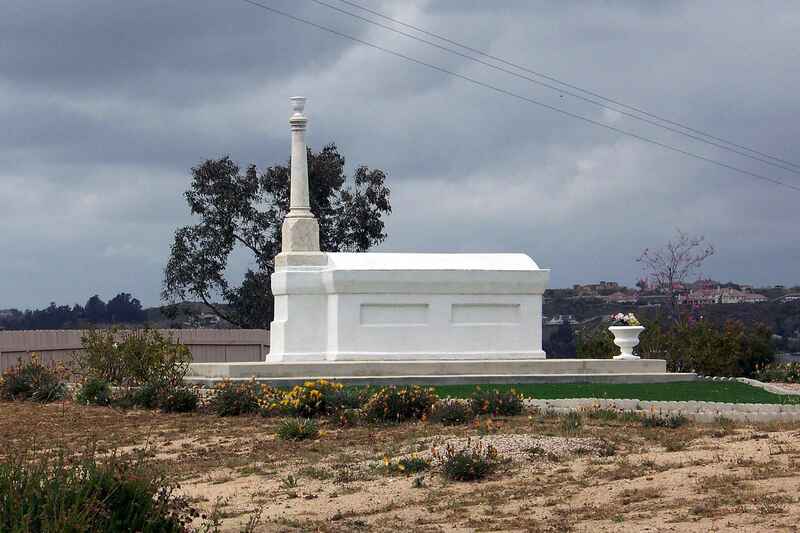 Louis Wolf is buried in a tomb overlooking Temecula that is located off of Loma Linda Road. The coffin is a raised brick sarcophagus that was restored by the Temecula Valley Historical Society in 2001.